You will have a specific date on which to expect the delivery and construction of your building of choice. The builder assigned to your building will give you a call confirming delivery of your order, either the morning of the arranged date between 6am-8am or the evening before the scheduled date. If the weather is not suitable for construction, you will be contacted the morning of the scheduled build. Your order will then be given priority as to the next available convenient date. 1) The builder will need to know the location you've chosen, mark with stakes for corners and doors. 2) Electricity for power tools. We bring extension cords. 3) Payment is due on completion of your building. If you will not be home upon completion, arrangements must be made for payment... ALL ORDERS ARE C.O.D.! To construct the building, you should allow three feet on any given side. Trees should be trimmed if the building will be constructed under trees. Backyard Building Systems will not do any excavating or clearing of the site. The location you choose for the building is very important. If your building will be constructed on prepared ground such as gravel beds, railroad ties, concrete block or slab, these items must be in place before our builder arrives. Concrete slab must be level within 1/2" and have had time to cure. Backyard Building Systems does not include leveling of a Building beyond 6". A leveling fee will be added. Installation delays due to requirements not being met will incur an additional trip charge of $75.00. Note: Carrying Fees are charged by the builder if access to the build site is not accessible by truck. Fees are determined by site access, distance to site, and building size. Backyard Building Systems Does Not Acquire Zoning Variances or Do Covenant Searches. Generally a permit is not required; but if your area does require a permit, it is your responsibility to obtain one. Please check with your city's Building Inspections Department for requirements and setbacks for your storage building. Most cities have a website with downloadable handouts and permit applications. We will be glad to help you with any questions you may have about filling one out. 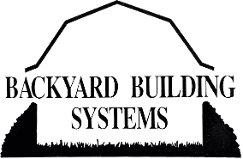 Backyard Building Systems does have the floor plans that may be needed. If you want to add or change anything on your order, please call our main office as soon as possible. Builders do not carry extra materials with them. Remember, we are here to help you. We will be happy to answer any questions that you may have about the construction of your new building. We want this experience to be a good one for you. Our family-owned business is all about Customer Service!